MASON, W.Va. — Now that’s how you make it convincing. 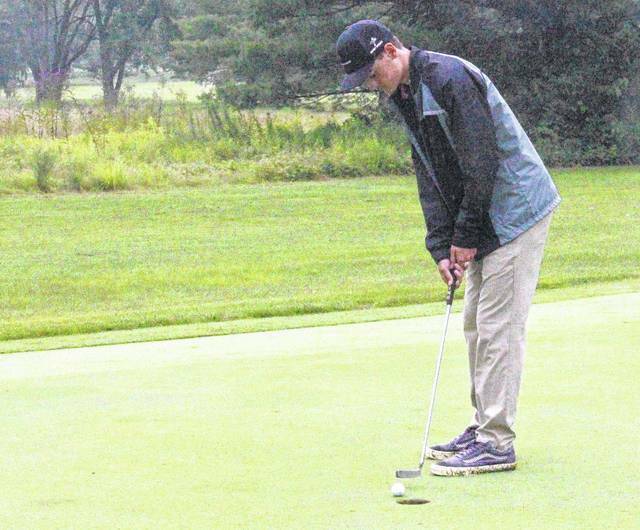 The Meigs and Wahama golf teams met on Monday for a non-conference golf match at the Riverside Golf Course, with the Marauders having two boys teams, Maroon and White, and one girls squad, Gold. The MHS Maroon team had the five lowest scores on the course and rolled to a 34-stroke victory. In the play six, count four format, the Maroon team’s total was 169, while Wahama took second with a score of 203. The Meigs White team combined for a score of 213, while the Lady Marauders were fourth with a total of 236. Leading the way for the victorious Marauders was medalist Levi Chapman, who had one birdie on his way to a two-over par round of 37. Next was Wyatt Nicholson with a 42, followed by Bobby Musser with a 44 and Bryce Swatzel with a 46. The Maroon team’s non-counting scores were a 47 by Cole Arnott and a 51 by Brayden Ervin. The White Falcons were led by Anthony Ortiz and Carl Sayre, who each recorded a 49 for WHS. Gage Smith had the team’s lone birdie on the day and shot a 52, while Jace Heckaman’s 53 rounded out the team total. The non-counting scores for Wahama were a 57 by Jay Sayre and a 66 by Kyher Bush. The MHS White team was led by Brody Reynolds with a 51, followed by Caleb Stanley with a 52 and Dawson Justice with a 53. Trenton Peacock fired a 57 for the White team, while the non-counting scores were a 59 by Gus Kennedy and a 60 by Bailey Jones. Kennedy recorded the White team’s lone birdie on the day. MHS freshman Kylee Robinson led the Gold team with a 57, while Shalynn Mitchell was one shot back with a 58. Mikayla Radcliffe and Shelby Whaley posted rounds of 60 and 61 respectively. The Lady Marauders non-counting scores were a 66 by Olivia Haggy and a 67 by Caitlin Cotterill. Both Meigs and Wahama are scheduled for league matches on Tuesday, the Marauders at Cliffside and the White Falcons at Lakeside. Meigs’ Cole Arnott putts on the 15th hole during the Marauders’ golf match against Point Pleasant on August 7 at Riverside Golf Course.